Don't miscommunicate. Watch Barter and be a good neighbor! House flies start bugging us first. Be prepared with your fly control options. Scroll to read What You Need to Know About Mosquitos to Not Have Them. Learn more about Fly Predator fan, Julie Goodnight's clinics in The Buzz. Our customer spotlight this issue is NRHA Hall-of-Famer, Tim McQuay! Have you ever noticed there's one thing missing from all the old western movies? Watch this video, see how it really was, and reorder your Fly Predators for this season. Your neighbors and animals will thank you! Guess who the celebrity horseman is in this video, email us your answer before April 7th, and if it's correct, we'll send you a FREE bottle of 4 oz. concentrate Bye Bye Odor! The house fly will be the first major nuisance fly (other than mosquitoes) to come out in spring. 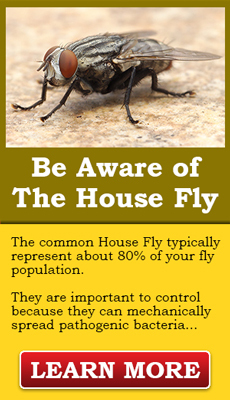 House flies are important to control because they can mechanically spread pathogenic bacteria. Best products for controlling house flies are the Fly Predators for breeding areas, and to catch adults the StarBar EZ Traps in/near buildings, the Bugpellent Essential Oil sticks for in stalls, and the Giant Fly Relief Bags away from buildings. Click here to read more. Mosquitoes have killed more people than all the wars ever fought so the dangers are very real, as we have found in the U.S. with Encephalitis and West Nile. Prevention comes from either removing or changing standing water every 3 days (when in doubt, dump it out) or by stopping the reproduction in the water by adding a Mosquito Torpedo, Bti dunks or mosquito-eating fish (Gambusia). Remove all unnecessary standing water like unused troughs, pots, buckets, etc. Add Blue Bird houses since they consume many insects including mosquitoes. Are you a Julie Goodnight fan? Did you know that you can join Julie Goodnight during her clinics across the USA! There’s still room to ride in her San Martin, California clinic April 30-May 1, 2016! Grab your friends, your horses, and go spectate or even ride! Click here to learn more! 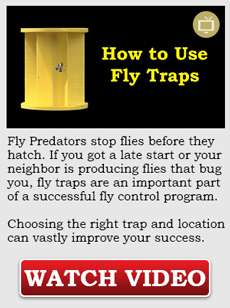 "Fly Predators have made our farm a virtually fly free zone. Flies are such a nuisance, getting in the way of both general horse health and happiness and efficient training, so we are really glad to have reduced them so much." Send your story + picture to info@Spalding-Labs.com!